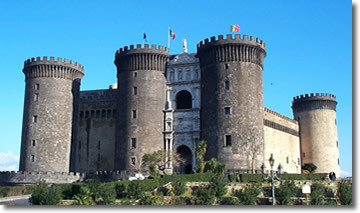 The building of the Castel Nuovo, also called Maschio Angioino, began in 1279 under the reign of Charles I of Anjou, on the basis of a plan by the French architect Pierre de Chaule. The strategic position of the new castle gave it the characteristics not only of a royal residence, but also those of a fortress. From the very beginning it was called "Castrum Novum" to distinguish it from the older castles dell'Ovo and Capuano. During the reign of Robert of Anjou the castle became a centre of culture giving hospitality to artists, doctors and men of letters among whom were Giotto, Petrarch and Boccaccio. The Anjevins were succeeded by the Aragonese Alfonso I who, like his predecessors, used the Castel Nuovo as the royal residence, beginning work of reconstruction and having built, on the outside walls, between the Torre di Mezzo (Halfway Tower) and the Torre di Guardia (Watch Tower) the impressive Triumphal Arch to celebrate his victorious entry into the city of Naples. The time of the Aragonese saw the passage from the medieval castle-palace to the fortress as it now appears; it was adapted to the new needs of a time of war and the area surrounding the Castle lost the residential character it had under the Anjevins. The structure of the Aragonese building is undoubtedly more massive than its Anjevin predecessor and was quite similar to the present-day castle, which is the result of the clearance works of the early years of the 20th century. At the end of the 15th century, the French succeeded to the Aragonese, though they did not remain for long as they were succeeded in turn by the Spanish viceroys and the Austrians. During the viceroy period (1503-1734), the defence structures of the castle, needed for purely military purposes, underwent further modification. With the advent of Charles III of Bourbon, who defeated the emperor Charles VI in 1734, the castle was surrounded by buildings of all kinds, warehouses and houses, and this happened time and time again. In the first two decades of the 20th century, the Municipal Council began the work of isolating the castle from the annexed buildings in recognition of the historical and monumental importance of the fortress and the need to reclaim the piazza in front of it. The castle is today the venue of cultural events and also houses the Municipal Museum. A tour of the museum takes us from the Armoury Hall, the Palatine or Saint Barbara Chapel, the first and second levels of the southern courtyard and the Charles V Hall and the Sala della Loggia which are to host exhibitions and cultural events.